binding in patient with frontotemporal dementia. Drugs that boost the function of a specific type of neurotransmitter receptor may provide benefit to patients with the second most common type of dementia, according to research published in the Journal of Neuroscience. Frontotemporal dementia, known as FTD, is a devastating disease in which patients have rapid and dramatic changes in behavior, personality and social skills. The age of onset for FTD is relatively young, usually striking patients in their mid- to late 50s. The prognosis is grim; patients quickly deteriorate and usually die within 10 years after onset. Currently, there is no effective treatment for FTD. The research team’s effort focused on mutations in certain genes, primarily in the Microtubule Associated Protein Tau gene. 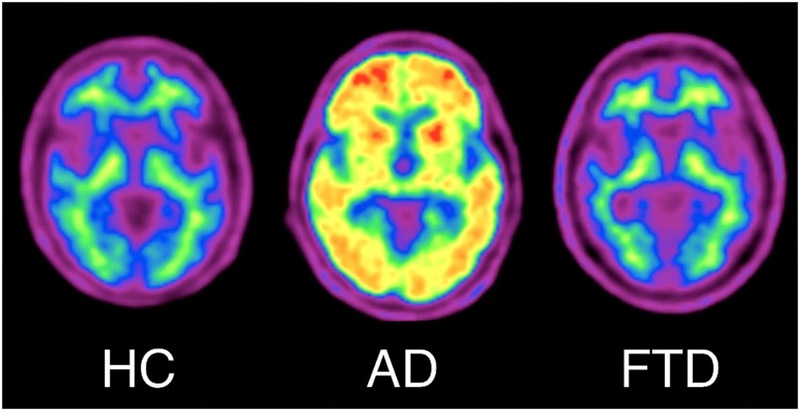 An accumulation of tau protein is associated with Alzheimer’s disease, the most common form of dementia; but little is known how tau mutations affect specific brain regions and cause FTD. The researchers used a new mouse model expressing human tau with an FTD-associated mutation. These mice demonstrate physical behaviors similar to those seen in humans with FTD - compulsive, excessively repetitive actions such as grooming, for example. The mice also had impaired synaptic and network function in certain brain network regions. They found that mutant tau impairs synapses - the connections between neurons - by reducing the size of the anchoring sites of an essential glutamate receptor called NMDA. Reduction of the anchoring sites left fewer NMDA receptors available at the synapse to receive excitatory signals, thus limiting synaptic firing and network activity. The team then employed cycloserine, a drug already approved for use by the FDA, which is known to assist NMDA receptor function. This boost of NMDA receptor function was able to restore synaptic firing and thereby restore network activity in the animal model. The restoration of normal network activity reversed the behavioral abnormalities seen in the mice. The researchers hypothesizes that increasing NMDA receptor function may benefit human FTD patients. With further preclinical validation, this hypothesis could be tested in clinical trials using the already available drug cycloserine.